The cost of batteries is one of the major hurdles standing in the way of widespread use of electric cars and household solar batteries. By storing surplus energy, batteries allow households to reduce power bought from the electricity grid. Unfortunately, batteries have so far been prohibitively expensive. But research published recently in Nature Climate Change Letters shows battery pack costs may in some cases be as low as US$300 per kilowatt-hour today, and could reach US$200 by 2020. This cost development is notably cheaper and faster decreasing than I and many others expected. The battery in a typical mid-range electric car stores around 25 kilowatt hours of energy. The analysis therefore suggests that the cost of electric car batteries may be as low as $7,500 today and reducing to $5,000 by 2020. Falling prices will pave the way for what could be a rapid transition to a cleaner energy system. Last year, my colleagues and I analysed the cost-benefits of household battery storage alongside rooftop solar systems. Encountering difficulty in finding reliable sources of present and future lithium-ion battery costs, we published our own study on The Conversation. Our analysis of ten studies published by research institutes and consultancies suggested a dramatic fall in battery cost over the next two decades, making solar power and electric vehicles more affordable. Björn Nykvist and Måns Nilsson of the Stockholm Environment Institute analysed 85 sources of data including journal articles, consultancy reports, and statements by industry analysts and experts. They report that since 2011 the number of electric vehicles worldwide has doubled each year. 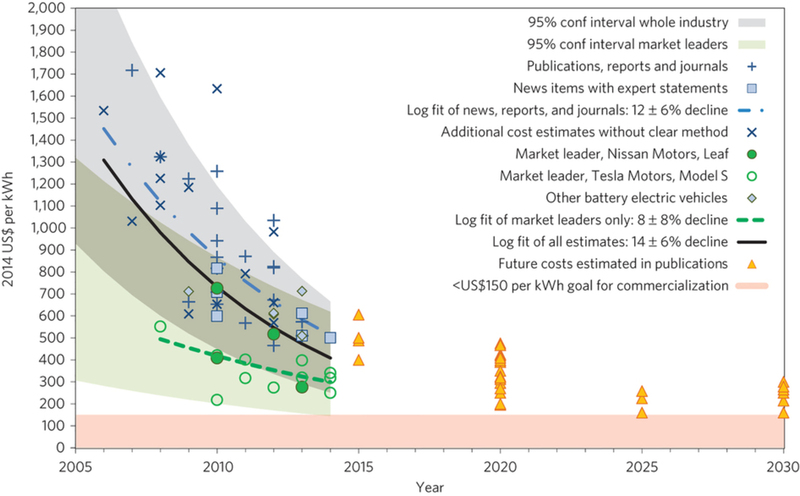 The core conclusion of the new paper is that the cost of full automotive Lithium ion battery packs has already reduced to around US$410 per kWh industry-wide. Market-leading manufacturers such as Nissan and Tesla are already seeing prices around US$300 per kWh. In our previous work we estimated these levels to be reached only in 2018 and 2022, respectively. The analysis also estimated that the industry as a whole is currently seeing annual battery cost reductions of 14 per cent, while for leading players with already lower costs this is closer to 8 per cent. It is therefore predicted that battery cost for all involved should converge to around US$230 per kWh in 2017-2018. This is seven years earlier than estimated in our previous analysis. Assuming continued electric vehicle sales growth, the authors suggest costs as low as US$200 per kWh are possible without further improvements in the cell chemistry. As battery costs decrease, technologies such as electric vehicles and household energy storage are likely to undergo a transition, from niche products in the hands of early adopters to standard acquisitions by pragmatic consumers. Companies in the sector are well aware of this potential for transition. This explains why, for example, Tesla Motors is making a US$5 billion dollar bet in the shape of a massive battery factory. By doing so, the company hopes to gain economies of scale and reduce costs further. Increased opportunities naturally attract commercial competition, which has the potential to further accelerate the technological improvements. On the flip side, however, intense competition can also turn ugly. This seems to be the case in a recently filed lawsuit regarding rival battery chemistry patents involving BASF, Umicore, 3M, and Argonne National Labs. In the context of the grid, larger energy storage resources offer many opportunities. Customers can use more energy produced by their own solar panels. By collaborating with customers, utilities can develop more intelligent and versatile grids. And jointly, the penetration of intermittent renewables in our electricity mix can be increased significantly. The findings published this month suggest that the transition from niche to mainstream product may well occur far sooner than people believe. And given that the perceived unlikelihood of governmental clean technology commitments in Australia has apparently reached April-Fools’-joke-worthy levels, it seems about time. Valentin Muenzel is PhD Candidate in electric vehicles and the electricity grid at University of Melbourne. This article was originally published on The Conversation.